It sounds like a story line for Hollywood. Newcomer buys horse. He takes horse to young trainer. Owner and trainer are both soft spoken men of few words. Weeks later horse wins Championship, large cash prize, and place in Hall of Fame. Things rarely happen that way in real life, but it did occur this past June when Steve Dampier of Rogersville rode Sweet Polly G. to victory in the 1983 Three Year Old Futurity for her owner of less than two months, Carl A. Potter of Des Peres, Mo. Carl Potter’s horse experience was in Saddlebreds when he decided he wanted a Missouri Fox Trotter. In April he purchased Polly from Ron Austin of Billings, Mo. The first of May he took her to Steve Dampier. Steve knew the mare since he’d ridden her thirty days the spring before when he did her initial breaking for Ron Austin. The afternoon shadows were growing long when Rusty McClure was photographed aboard Clipper on February 11, 1951. Clipper was the only horse that Rusty would never sell or trade. When asked about his mare’s background Mr. Potter stated that she was raised by Warren Gamel of Willard, Mo. After that he produced her papers and said they’d have to tell the story since he was not yet familiar with Fox Trotter bloodlines. The names and numbers that marched across the page were not only some well-known Fox Trotters from the past, they were a mini-roll call of some old horsemen which have left us within the last few years. Polly’s sire is Zane’s Grey Sam. The late Parlie Edge of Stockton, Mo. 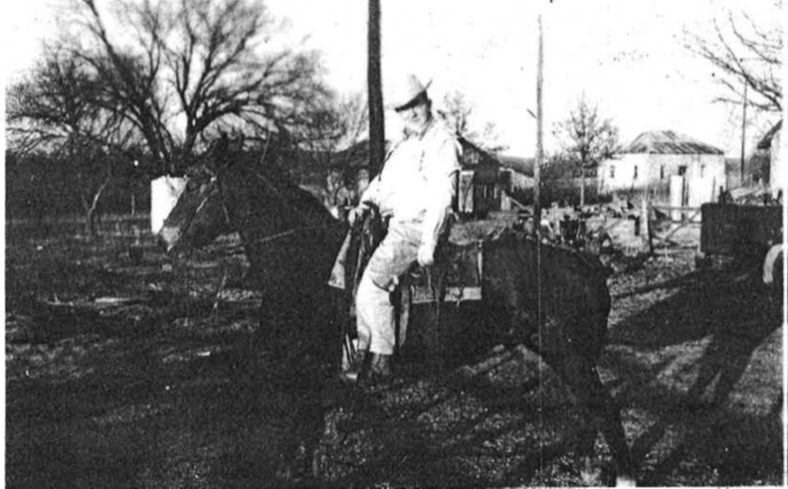 raised Zane’s Grey Sam by Zane Grey out of a handsome black mare that was owned and shown as a two­ year old by the veteran showman and longtime Polk County Sheriff, the late Elmer Hicks of Bolivar, Mo. Polly’s dam was sired by Walker’s Merry Lad. Her 2nd, 3rd, and 4th dams all belonged to the late Edwin “Rusty” McClure at one time. In fact Clipper, the mare he raised by Ted, was the only horse Rusty ever owned that he wouldn’t sell or trade. Last winter Rusty McClure finally lost his battle for life to the emphysema scarred lungs that bad been gradually muffling his rumbling laughter and relegating him to ringside during the past few years. But forty years ago Rusty was a young man and Clipper was a long-legged foal. Edwin “Rusty” McClure was born in 1912 near Eldridge, Mo. 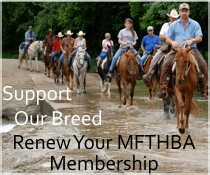 He was a farmer and stockman, a horseman, and a natural born trader. The community where he grew up used Fox Trotters and the quality of a man’s horse and his ability to ride were very important, especially in the circle of stockmen who rode the hills buying livestock and driving them to market. Toward the end of the Great Depression, Rusty bought a good sorrel Fox Trotting mare named Ribbon from a neighbor, Baxter Cole. Ribbon was from Tom Dampier stock which originated on the farm next to Rusty’s home place. Rusty rode Ribbon hard in those lean years and he often told Hazel, the petite school teacher that he married, “Ribbon rides like setting in a rockin’ chair.” Ribbon was the 4th dam of Sweet Polly G.
In 1942 at the Springfield, Mo. stockyards Rusty first saw Ted, a high styled seven-year-old chestnut stallion owned by Kniel Kissee, operator of one of the yard’s commission firms. He decided on the spot that he had to have a Ted colt. Shortly after that he hauled Ribbon to Sparta, Mo. and bred her to Ted. In the spring of 1943 Ribbon produced a chestnut a filly that Rusty and Hazel named Clipper. Rusty and Hazel spent a lot of time on Clipper her first summer. Rusty enjoyed training colts and he was good at it. That same year he helped organize the Laclede County Saddle Club. When the club had its first horse show that fall Rusty rode Ribbon and led Clipper. Thus Clipper’s show career began. Rusty was to show her many times in the years that followed and she won lots of ribbons. About the time Rusty hauled his mare to Ted, one of his lifelong neighborhood chums, Joe McCain, was smitten with palomino fever. The Golden Horse Show was a big thing at the Springfield Coliseum in the early ’40 s and that no doubt influenced Joe’s thinking. Joe’s father, Wheeler McCain, was a superb horseman, but Joe’s interests had always leaned toward automobiles. 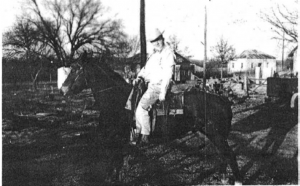 At any rate, Joe and Rusty loaded Wheeler’s good sorrel saddle mare into Rusty’s truck and hauled her clear to Christian County to a palomino stallion named Ozark Golden King for the service that produced Golden Governor. Golden Governor and Clipper were both born in 1943. When Clipper was a yearling, Rusty and Hazel moved to a large farm on the Osage Fork River in eastern Laclede County. Hazel taught at Cross Roads, a rural school about five miles from their farm home. The main county road was nothing to brag on but the road that branched off to the school house wasn’t maintained at all. If a tree fell across it, the custom was to find a way around the tree. In wet weather the school house road turned into a sea of mud. Hazel found that she had two choices. She could walk to school or ride a horse. She wound up riding Ribbon quite- a lot when she taught at Cross Roads during the Closing years of World War II. After Clipper was old enough to start riding, she became Rusty’s number one horse. He used her working cattle, traveling about the neighborhood, and showing. But her life was different from that of her mother. The world had changed and Clipper never experienced the everyday over the road hard kind of riding that old Ribbon had known. Rusty sold his farm near Eldridge in 1949 and bought property at the north edge of Lebanon. At their farm sale” Hazel overheard Rusty telling a man that Clipper was going to have a colt, which was surprising news to her. That spring Clipper produced her first foal, a chestnut filly by Golden Governor that they named Trixie. Rusty sold Trixie to his father-in-law, Neal Alexander. Neal Alexander took great pride in his horses. He was a slim, neat man and a straight backed rider, who presented an elegant appearance on a horse. Mr. Alexander only made about one horse show a year but he went to win…and he generally did. He showed Trixie with great success in pleasure classes and collected some handsome hardware competing against other saddle breeds for there were no classes exclusively for Fox Trotters when Trixie was in her prime. Finally the years put a stop to his horse showing, but he continued to operate his farm until he was past eighty. He never made the transition to tractors and cars for Neal Alexander remained strictly a horseman to the day he died at age 87. Trixie was 25 then Clipper’s first-born lived out her remaining years in the care of the Alexander family. In the meantime Rusty sub-divided his Lebanon property, then bought a river farm. A few years later he sold that place and bought another three miles west of Lebanon. He owned and rode a lot of different horses during those years. Two sons of Golden Governor that he owned later became World Champion Missouri Fox Trotters. Horses came and horses went, but old Clipper stayed. When Clipper was twenty-two years old she produced a palomino filly by a fancy little copper palomino stallion that Rusty owned named Comanche. Although the way Comanche’s name was spelled sometimes depended on who was trying to write it down, he was a son of Yellow Jacket F-175 and his registration number was F-1682. Nelson Tyler of Willow Springs, Mo., wound up with Sunset Gold F-4726, this daughter of Clipper’s old age. Walker’s Merry Lad was a very popular sire around the Willow Springs, Mo., area and Sunset Gold was bred to him. This mating produced Sunset Fashion Lady 7468, the dam of Sweet Polly G.
Clipper passed on around the age of 25. Rusty didn’t tell Hazel until she had been gone awhile. Hazel said she guessed he wanted to avoid having a funeral.